Dried achene or anthocarpous accessory fruits of Rosa multiflora Thunb., Rosae fructus (“Eijitsu” in Japanese), have been used in clinical practice to improve constipation within traditional Japanese medicine. Recently, it has been claimed that the efficacy of this crude drug is decreasing, and multiflorin A, the purgative component, was not detected within the tested samples. In order to clarify the causes of this issue, we investigated Rosa section Synstylae (Rosaceae), including R. multiflora, growing in Japan and South Korea with a focus on the secondary metabolite, multiflorin A. We recognize that there are two chemotypes based on the presence (Type I) or absence (Type II) of multiflorin A. Type I contains quercitrin, multinoside A, multiflorin B, and multinoside A acetate as major index compounds. Type II contains hyperin, isoquercitrin, quercetin 3-O-glucuronide, and 3′-methoxy-isoquercitrin as the major index compounds. The chemotype of Rosa section Synstylae (Rosaceae) plants collected in Japan (excluding Tsushima Island) were all classified as Type I with exception of two species, R. luciae and R. sambucina. On the other hand, both Type I and Type II were detected within Rosae fructus obtained from R. multiflora collected in South Korea and Tsushima Island, Japan. The results indicate that Rosae fructus from R. multiflora (Type I) from Japan, excluding Tsushima Island, should be employed clinically, which we describe as purgative. 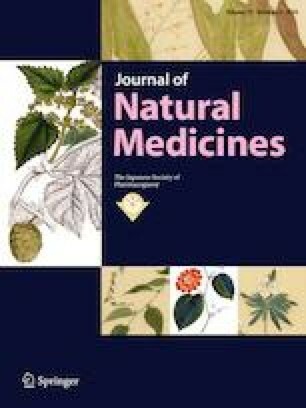 The authors are grateful to Dr. K. Minoura for NMR spectra recordings and Dr. M. Fujitake for mass spectra recordings at the Osaka University of Pharmaceutical Sciences and Dr. K. Ozaki for collecting R. multiflora in Kyoto, Aomori and Fukuoka.